Drone-2000 is a series of critical productions that echo the recent Western attraction for this seemingly playful technology, birthed through both military research and scale modeling. 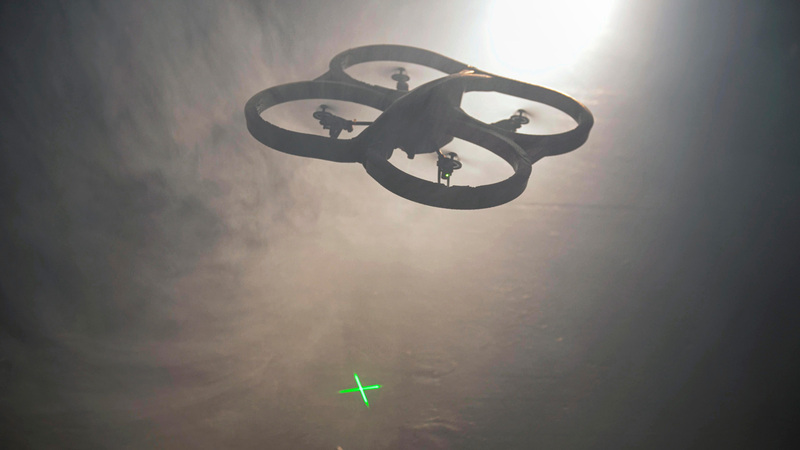 For nearly ten years, the use of drones has spread across the fields of hacking, cinema, gaming and the art world. They are highly promoted by the very companies that produce them as well as the military-industrial complex, and through product placement in the gaming industry and the science-­fiction fantasies inherited from the 20th century. Drone-2000 is a performance where autonomous systems, controlled by precarious algorithms, coexist with an audience. Their latent and dysfunctional presence is a tangible threat. Drone-2000 projects us into a dystopian situation, thus illustrating the military origins of these entertaining objects as well as their recent use by police forces. Here, trusting the autonomy of the machine is not only a discursive concept but a true experience shared with the audience, triggering visceral and psychological reactions, in the face of symbolic and real danger.